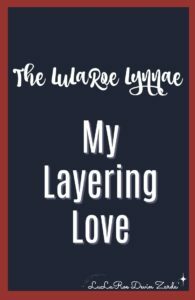 If you’ve been in my VIP Group on Facebook, on Instagram, or my personal page, it’s easy to see that the LuLaRoe Lynnae is my layering love and one of my favorite pieces. Well, why? Don’t worry! I will cover all of my reasons why in this article. 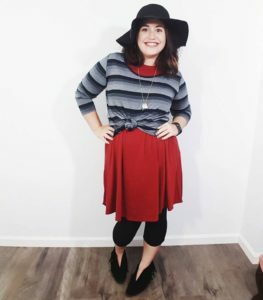 Why do I love the LuLaRoe Lynnae? First off, it’s the fit. The Lynnae is like the Classic Tee, but with long sleeves. Never tried a Classic? Well, let me describe it to you. These shirts have a mid-scoop neckline, are fitted through the chest, but then flare away from the body. It’s also slightly longer in back than it is in the front so your booty is covered when you’re wearing a pair of leggings. These shirts look fantastic with leggings, skirts, or my personal favorite, a great pair of jeans. The Lynnae has a true long sleeve making it perfect for layering! Bam! My first reason why I love the Lynnae! Like I said above, the Lynnae is perfect for layering. Winters here in Wisconsin can be brutal. I know, that’s no surprise. Kids here are taught at a young age that wearing layers helps trap air, therefore keeping you warm. The Lynnae is PERFECT for this! Even though it looks cute on it’s own, I love to throw one on over or under a Carly. If I’m putting it on over, I knot the Lynnae at the skinniest part of my torso, under my bust. If I put on the Lynnae under the Carly, I’ll do any of my usual styling tips and tricks on it. But seriously, you can use the Lynnae to make any shirt a long sleeve. Want to know more some of my favorite ways to layer in style? Here you go! READ How To Travel To Your Direct Sales Convention-FOR CHEAP! The fabrics the Lynnae is made out of are a dream! There are so many different fabrics that the Lynnae comes in. Some of these include include a very stretchy and soft jersey, a waffle weave that reminds me of a thermal material, a sweater that is made of wishes and dreams, and a cotton that feels like that t-shirt your significant other has owned for the past decade that is so soft to the touch. Some of these fabrics I haven’t seen in any other style! 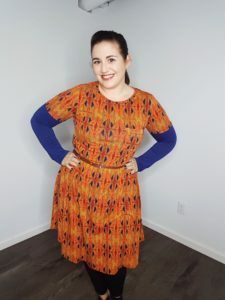 And finally, the fit of the LuLaRoe Lynnae is flattering. It’s fitted through the chest, but then skims over the tummy and hips. I love this because it hides the lumps and bumps that I don’t want to show. It’s the perfect length to cover my booty if I’m wearing leggings, jeans, or shorts. The Lynnae is also a favorite of mine for summer. Here in Wisconsin it can definitely cool down at night, so having a long sleeve shirt to throw on after the sun goes down is crucial! The Lynnae is perfect for this! 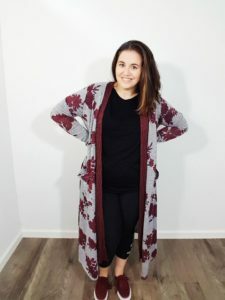 If you would like to come shop the LuLaRoe Lynnae, join my group HERE! All of my Lynnae’s will be dropping in the next few days.